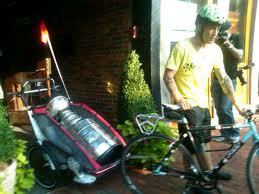 Bruin Andrew Ference took the cup around town in a bike trailer. I love and respect this move beyond words. Mr.Ference has slowly crept up into the top 5 of guys I would like to be when I grow up. It’s hard to dispute. Homeboy is rocking a yellow T, on a bike, some badass ink work on both arms, is a pro hockey player, speaks out on environmental issues in the preseason with his hot as hell wife by his side, then just goes ahead and takes a spin around Boston with the Cup when it’s his time! Unadulterated awesome! 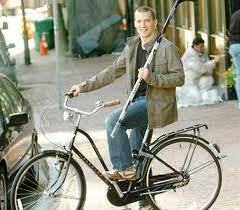 He gets points for bringing it to the rehab hospital he visits so the kids could get a taste of the action. 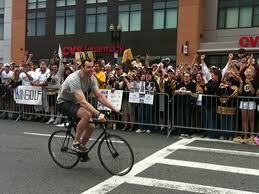 I’m going out on a limb here, but are the Boston Bruins the number 1 CarFree Team in all of sports? This is based on very little fact and mostly because I want them to be so that can incorporate the Bruins Logo into the CarFreeBrad logo(as soon as I design one). Even with very little to back it up, the evidence of CarFree Awesomeness is building! This entry was posted in Bike commute, Car Free, Urban Bike and tagged Andrew Ference, Boston, Boston Bruins, Cup takes a ride, Hockey, Stanley Cup. Bookmark the permalink.